My school has several document cameras, in the care of the librarian. To use one, a teacher has to go ask to sign one out. They don’t seem to be very popular, so I went and signed one out on the 10th. I wish I had figured this out the FIRST week of school, when I was teaching Physics 1 students how to draw a best-fit line on their graphs of their data. It would have been much easier than what I resorted to, which was drawing a grid, line-by-line, on my whiteboard. My first choice would have been to use the “smart” board but that was about the same time as the computer meltdown and I didn’t have all the software back on my machine yet. I am hoping to get a fair amount of use out of this thing, especially when I have an uncooperative paper document that I don’t have time to scan or which for one reason or another I can’t project any other way. Plus, I may be able to use it to show small things happening on the desktop that would otherwise be difficult to show to an entire class all at once. I am looking forward to seeing what else this is good for! 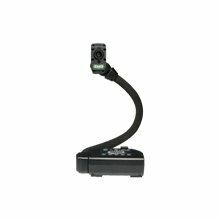 Do you use a document camera? How? Actually, it’s interesting to think of the possibilities, since with the combination of this and the smartboard you could co-opt the camera, point it at any lab demonstration, and mark-up the demo, Madden-style.